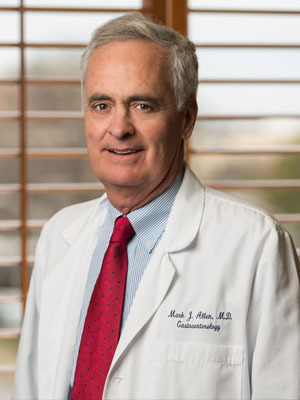 Dr. Allen received an undergraduate degree from the University of Kansas in Lawrence, Kansas in 1975, and a medical degree from the University of Kansas Medical Center in Kansas City, Kansas in 1978. Dr. Allen completed an internship and residency in internal medicine at St. Luke’s Hospital in Kansas City, Missouri in 1981. He finished his fellowship in gastroenterology at the Mayo Graduate School of Medicine, Mayo Clinic in Rochester, Minnesota in 1984. He was an instructor at the Mayo Medical School from 1982 to 1983, and received the Donald C. Balfour Award for meritorious research by a clinical fellow, bestowed by the Mayo Clinic Alumni Association in 1985. Dr. Allen is a fellow of the American College of Physicians (FACP) and is certified by the American Board of Internal Medicine (ABIM), the ABIM subspecialty of gastroenterology, the states of Minnesota, Kansas and Missouri and the National Board of Medical Examiners. He is a clinical professor at the University of Missouri-Kansas City. He invented and holds a patent for a novel method of dissolving gallstones. He has published several articles and abstracts on gallstone disease, and has made presentations to local, national, and international conferences. Dr. Allen has a special interest in inflammatory bowel disease and diseases of the biliary system. Dr. Allen enjoys golf, college basketball and reading. He is married and has three sons.